When many people think of Nevada, they think of the dazzling Las Vegas Strip or spooky Area 51. Although it’s true Nevada attracts visitors with its mystery and Vegas nightlife, the state also offers many breathtaking natural sights. Nevada is mostly desert, within the Great Basin, but it is also home to towering mountains, crystalline lakes and landscapes lush with sagebrush and pine. From fiery canyons to mesmerizing gold-mining ghost towns, Nevada holds adventurous surprises for every type of traveler. In this post, we’ll put on our best boots and show you the most beautiful attractions in Nevada. Did you know that Nevada is both the driest state in the country and home to Lake Tahoe — the country’s largest mountain lake? Lake Tahoe, with its turquoise water and surrounding snow-capped mountains, attracts over two million visitors a year. Located about an hour south of Reno, the Lake Tahoe region offer numerous opportunities to hike, camp, ski, kayak or enjoy a picnic and drink in the scenery. For example, in the north, visitors can take a dip at Sand Harbor and explore interesting rock formations in the water against a backdrop of coniferous trees and imposing mountain peaks. Visitors can also head south to Cave Rock to drift along in a boat while peering up at a steep rocky shoreline. Lake Tahoe’s picturesque beauty makes it a top destination year-around. Summer is the busiest season and attracts visitors who want to swim in the lake. However, winter is also a popular time of the year as skiers head to the region to hit the slopes. If you prefer to visit the area when tourism slows down, consider planning your trip from March to May or from September to November. The weather may be cool, but it’s comfortable enough for a day enjoying one of the most gorgeous places in Nevada. Here’s a fun piece of information to further inspire your trip: Some claim a prehistoric monster, similar to Scotland’s Nessie, lives in the lake, with the most recent sighting occuring in 1972. Who would want to miss a chance at spotting a mysterious lake monster? Imagine wandering an otherworldly terrain surrounded by massive fiery red sandstone. Welcome to Valley of Fire State Park. Valley of Fire contains 40,000 acres of Aztec sandstone from the Jurassic period, along with petrified trees and petroglyphs more than 2,000 years old. Here, visitors can camp, picnic, hike and explore a visitor center to learn more about the park’s fascinating geology, ecology and history. You’ll also get a chance to observe the petroglyphs etched on rock formation walls as you meander through the park. Located about an hour northeast of Las Vegas, Valley of Fire State Park makes an excellent day trip from the city. The best time to visit is in the spring and fall as winter gets busy, and summer is sweltering. Daytime temperatures can rise above 100 degrees in the park during the summer, so that’s something to keep in mind while you’re planning your vacation. Tonopah is a small town that is far from city lights. That’s what makes Tonopah’s night sky especially dark and perfect for stargazing. What started as a mining town, Tonopah is now celebrated as a stargazing destination. According to Tonopah’s tourism site, visitors can view thousands of stars on a clear night in Tonopah, while in most cities you may only be able to see 25 stars. They even have a park dedicated to stargazing, named Tonopah Stargazing Park where you can set up a telescope or behold the beautiful stars in the sky without special equipment. To pass the time before the sun sets, there are other fun things to do in Tonopah. For example, you might visit the Tonopah Historic Mining Park to explore over 100 acres of the town’s mining past. Here you can tour buildings, mine shafts and more to get a true sense of what it was like to be back in Tonopah’s booming mining days. Ghost hunters might enjoy visiting the eerie Old Tonopah Cemetery where outlaws, mining accident victims and town heroes are just a few of the individuals buried here. Tonopah is set about halfway between Reno and Las Vegas, so it can be quite a drive from either location. Nevertheless, Tonopah is a fascinating place to visit any time of the year, keeping in mind the summer heat. Located near the border of Utah, Great Basin National Park is home to some of the oldest trees in the world. The park is famous for containing ancient bristlecones, some of which are 3,000 years old. The area holds dozens of basins and rivers that flow inland and features a landscape carved from glaciers during the Ice Age. While at the park, visitors can explore 65 miles of trails where they might come across an alpine lake or catch a glimpse of a mountain lion, coyote, bobcat or badger. Park visitors can also take a guided tour of Lehman Caves. The park is open year-round, but the last eight miles of Wheeler Park Scenic Drive may be closed during the winter. Summer is the most popular time to visit, and the temperature is usually mild. September and October are cooler months but attract smaller crowds. Nevada is home to many geological wonders, some which you can explore up close at Cathedral Gorge State Park. Located in the eastern part of the state, Cathedral Gorge State Park features spire-like rock formations sculpted over time by erosion. Walking trails invite you to wander through the cavernous formations and to get lost in a world of natural art. Cathedral Gorge State Park is a photographer’s dream, but it’s also perfect for an unforgettable hike or picnic. A four-mile loop trail provides access to more remote trails for those who want to step off the beaten path. Besides the opportunity to enjoy the unique natural sculptures resulting from millions of years of geological workings, you might also use the park as a chance to spot wildlife like kit foxes, rabbits, coyotes or lizards. The park is open every day of the year, but it’s usually dry and hot in the summer and cold in the winter. If you wish to see a variety of non-poisonous lizards and snakes, consider touring the park sometime during the spring through fall. Just make sure to bring plenty of water. Located just minutes from downtown Carson City, Washoe Lake State Park offers jaw-dropping views of the Sierra Nevadas. Located in the Washoe Valley, the area is where the Washoe Tribe spent their winters before heading to Lake Tahoe for the summer. They used wetland plants from the area like willows and cattails to form baskets and hunting tools. Washoe Lake State Park was established in 1977 to preserve part of the Washoe Valley and its fascinating past. Visitors can enjoy hiking, camping, water sports, horseback riding, fishing and more. Although Washoe Lake offers something for everyone, it’s especially a haven for bird lovers. For thousands of years, portions of the lake were wetlands, attracting various bird species. The Scripps Wildlife Management Area in the northern region of the lake and the Washoe Lake Wetland Project to the south contain most of the areas remaining wetlands. It is here that many migratory birds and waterfowl spend their time. Bird lovers will enjoy the chance to spot a great blue heron spreading its vast wings or a white-faced ibis fishing along the shore. Other common wildlife includes deer, coyotes, hawks and eagles. If you want to visit the park, consider going in the spring or fall, as both the winter and summer can be harsh. 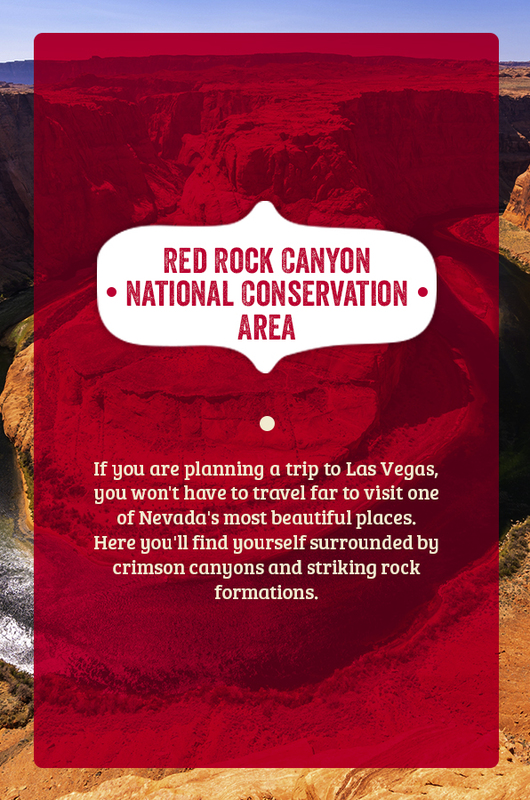 If you are planning a trip to Las Vegas, you won’t have to travel far to visit one of Nevada’s most beautiful places — Red Rock Canyon National Conservation Area. Here you’ll find yourself surrounded by crimson canyons and striking rock formations. There are dozens of ways to spend the day at Red Rock Canyon whether you wish to hike, go rock climbing or enjoy a 13-mile-long scenic drive. Located only 17 miles west of the heart of Las Vegas, the areas attracts more than two million visitors a year and is the state’s first national conservation area. Perhaps one of the best ways to explore the park is to hit a few of its many trails. For example, the Moenkopi Loop is an easy, two-mile loop trail that starts at the visitor center and takes hikers to view cliffs, Triassic fossils and a range of desert wildlife. The Overlook Trail is a paved path, easily accessible from the parking lot, and it provides a spectacular view of Red Rock Canyon. No matter what you choose to do at Red Rock Canyon, it’s worth stopping at the visitor center before you start your adventure to learn all about the canyon and the Mojave Desert or to pick up a souvenir. You’ll even get to wander the outdoor desert tortoise habitat for a chance to see a desert tortoise — Nevada’s state reptile. Lastly, don’t forget to grab a trail map. Temperatures can exceed 100 degrees during the summer months, and lightning storms frequently occur during the summer, so you may wish to choose a different season to visit. If you want a better chance of spotting a tortoise, consider heading there in the spring when the tortoises emerge from brumation. The warm desert sun keeps Red Rock Canyon toasty enough for a comfortable trip in the winter, so you may consider visiting this time of the year as well. Either way, Red Rock Canyon National Conservation Area gives visitors a chance to experience the mystery and diversity of the desert and to walk among fascinating formations of various shapes, colors and textures — all which seem to have their own stories to tell. If you find yourself struggling to choose between mountains, canyons or lakes when searching for the prettiest places in Nevada, look no further than Lake Mead National Recreation Area. Here, you’ll find the best of all worlds. There’s so much to do and see at Lake Mead, which encompasses over a million acres. Located less than 30 miles from Las Vegas, Lake Mead covers land in both Nevada and Arizona. Several different qualities make this area special. First, the region is incredibly diverse and offers a large variety of recreational opportunities, and it’s here you’ll find some of the most stunning views in the state. Second, it’s where you’ll find the Hoover Dam. Most of the park is accessible by boat, and you might consider exploring the Black Canyon Water Trail, which is a portion of the Colorado River. The Black Canyon Water Trail is a National Water Trail and the first to flow through a desert. It’s accessible at the base of the Hoover Dam or near the mining town in Eldorado Canyon. The Black Canyon Water Trail runs for 30 miles and features beaches, caves, coves, hot springs and chances to spot desert bighorn sheep. Old structures remaining from the construction of the Hoover Dam can also be seen. If you decide to cruise the Black Canyon Water Trail, get ready to snap photos in Emerald Cave where the water takes on a green glow at the right angle. There are plenty of ways to explore the area by foot as well. For example, the Historic Railroad Trail is a dog-friendly easy hike that provides views of Lake Mead and overlooks the Boulder Basin area. Here you can travel through five large tunnels, about 300 feet high and experience part of the route that ran from Boulder City to the Hoover Dam from 1931 to 1961. For more hiking opportunities, head to Northshore Road where you can access many different scenic trails such as the Wetlands Trail and the Redstone Trail. The National Park Service suggests visiting the park in the fall and spring, as the summer can be excessively hot, reaching up to 120 degrees. Winter temperatures can also be harsh and dip far below freezing on the high plateaus. Nevada undoubtedly has some of the most visually striking landscapes in the country, from jagged sunbaked cliffs to tranquil mountain lakes. Did we mention one of the most beautiful sights in the Silver State is a slice of warm gooey pizza from Giordano’s? If you’re heading to Las Vegas, make sure to try the most eye-pleasing and belly-pleasing, pizza in the state. At Giordano’s, we’ll help you fuel up for a desert hike with satisfying bites, from our famous stuffed deep dish pizza to classic Italian fare. To satisfy your canyon-sized hunger, visit us at one of our Las Vegas locations today!